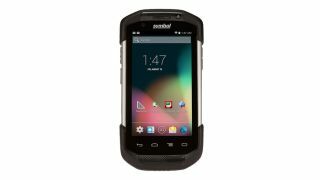 Motorola Solutions has lifted the lid on the Symbol TC70, a rugged mobile computer aimed at enterprises in a number of industries - from retail to wholesale and manufacturing. The device is essentially an Android 4.4 Kitkat-powered smartphone housed in a tough casing that can be used in a variety of harsh conditions using fingers, gloves or a stylus. Although the TC70 runs Android, it's not something that consumers will be interested in. Motorola Solutions only deals in hardware for businesses, and is completely separate from the consumer-focused Motorola Mobility unit that Google bought in 2011 (and is currently in the process of being sold to Lenovo). The TC70 combines the ease of a smartphone with purpose-built durability, reliability and performance, according to Motorola Solutions. It features a 4.7-inch Corning Gorilla Glass 2 HD display and comes with certification for more than 50 applications - from inventory checks to workforce and inventory management. It's VoIP-ready and works with Motorola Solutions' Extensions (Mx) MDM and security solution, which allows businesses to integrate bar code scanning, signature capture, image capture and payment processing abilities. Other features include PowerPrecision batteries, IP67 sealing and a resistance to high drops onto concrete, its maker boasts. The TC70 also has a two-way radio that can be used for on-site communications. There's no word on availability or pricing just yet, but don't expect to get any change from a tenner (if you know what we mean). Android Lillipop vs KitKat: What's the difference?